Pumpkin provides a number of essential nutrients such as iron, potassium, copper, manganese, riboflavin, and vitamins A and C. It contains carbohydrates, so it can raise your blood sugar, but it also contains a number of substances that help minimize its effect on blood sugar, so it can be a good vegetable choice for diabetics. The nutrient content of pumpkin depends on whether the pumpkin is fresh or canned. If you cook and puree the pumpkin yourself, it will have fewer calories, carbohydrates and nutrients than if you purchase canned pumpkin puree. Canned pumpkin puree contains less water and is more concentrated than fresh. A serving of carbohydrates for a diabetic is 15 grams. Each cup of mashed, cooked fresh pumpkin contains 12 grams of carbohydrates, including 2.7 grams of fiber, and a cup of canned pumpkin puree has 19.8 grams of carbohydrates, including 7.1 grams of fiber. Part of this fiber consists of soluble fiber, which can slow the emptying of the stomach and the release of sugars into your bloodstream, making it easier to avoid spikes in your blood sugar levels. The glycemic index can help estimate how much a food is likely to increase your blood sugar levels, with foods that have high scores over 70 having more potential to cause spikes in blood sugar levels than those with a low score under 55. Pumpkin has a GI score of 75. This isn't the best measure of the effect of pumpkin on blood sugar, however, since it is based on a portion containing 50 grams of carbohydrate. Another tool, called the glycemic load, takes the carbohydrate content of a serving of food into account, as well as the glycemic index, with scores under 10 considered low. Using this tool, pumpkin isn't likely to cause blood sugar spikes, because it has a low glycemic load of 3. 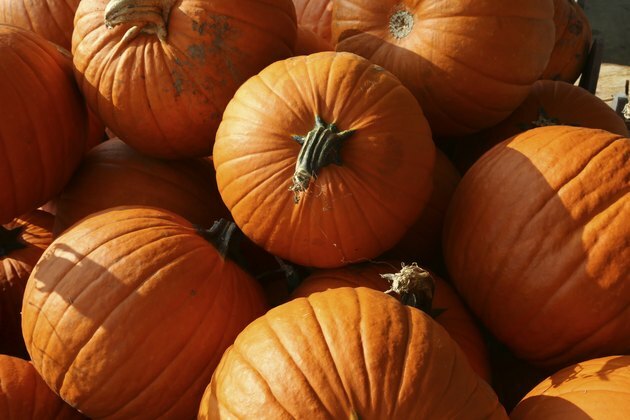 Preliminary research shows pumpkin may have beneficial effects for diabetics. A study using rats, published in 2009 in "Bioscience, Biotechnology, and Biochemistry," found that pumpkin contains substances called trigonelline and nicotinic acid that may help improve insulin resistance and slow the progression of diabetes. Pumpkin also contains certain types of polyphenols, or antioxidants, which may help lower blood sugar levels, according to a laboratory study published in the "Journal of Medicinal Food" in June 2007. Another study using rats, published in "Plant Foods for Human Nutrition" in March 2005, found that substances called protein-bound polysaccharides in pumpkins lowered blood sugar levels and improved glucose tolerance. More studies are necessary to see if pumpkin has these same benefits in people.